Uintah Machine has built uncounted supply trailers for mines all over the country in the past 30 years or so. They are tough, to say the least. We don't sell many parts for them. But if you want to mine coal rather than fix trailers, this is what you need. Supply trailers are a Uintah Machine specialty. 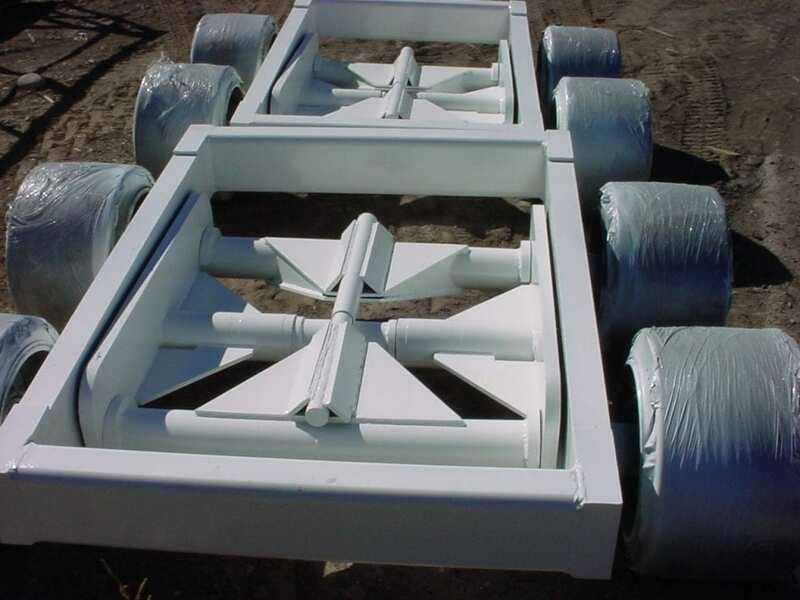 Our heavy-duty trailers are well known for being incredibly long-lasting, durable, and rugged. Our trailers have been known to run maintenance-free, excluding periodic lubrication, for up to eight years. (Even we can’t keep tires from wearing out). Occasionally we are asked to refurbish trailers built by others, putting our suspension on them to make them perform like ours. Uintah Machine manufactures a large variety of custom heavy-duty trailers for general use. We can design and build trailers in many shapes and sizes to transport many types of equipment, materials, utilities, and supplies. Some have hydraulic push-plates for easy unloading. They have a 20-ton carrying capacity. Deck heights of 24" are the norm, but heights as low as 18" can be obtained. Stake pockets are optional, and sideboards, headboards, and rub bars are also available. Landing legs can be manual or hydraulic. Trailers can be built with a standard pintle hitch, retractable pintle hitch, fifth wheel hitch, or fifth wheel with folding gooseneck to allow them to go down a shaft. Also consider an optional tail roll. This is an idea we brought in from the oil field, and it simplifies unloading of some materials. And when use with a winch, it makes loading of material skids a lot easier, too. As a standard, the trailers are equipped with Uintah Machine's walking beam suspension to keep all four wheels on the ground at all times for a relatively smooth ride and increased carrying capacity. We use the same bearings, hubs and seals as would be on most any semi-trailer going down the highway. Same spindles, too, most of the time. Uintah Machine is particularly proud of these trailers, and believe them to be the highest-quality, lowest-maintenance heavy-duty trailer available. Our customers seem to be pretty happy with them, too. Uintah would be please to design and build a mining trailer for you. Call or email us at 435-738-2453 to learn more.